Celebrating her first five years in service, Cunard's stately flagship, Queen Mary 2, embarked on her maiden round-Britain cruise in October 2009. During this special voyage, QM2 entered Clyde waters for the first time on October 19, paying homage to the river which began the Cunard dream in 1840 and built over 100 of her illustrious predecessors. Outstanding among these were, Britannia, the very first Cunarder, Lusitania, Aquitania, Caronia, and of course, QM2's legendary Queen predecessors, Queen Mary, Queen Elizabeth, and the iconic QE2. All were launched into these same Clyde waters before playing their parts in making the name of Cunard so highly esteemed throughout the maritime world. 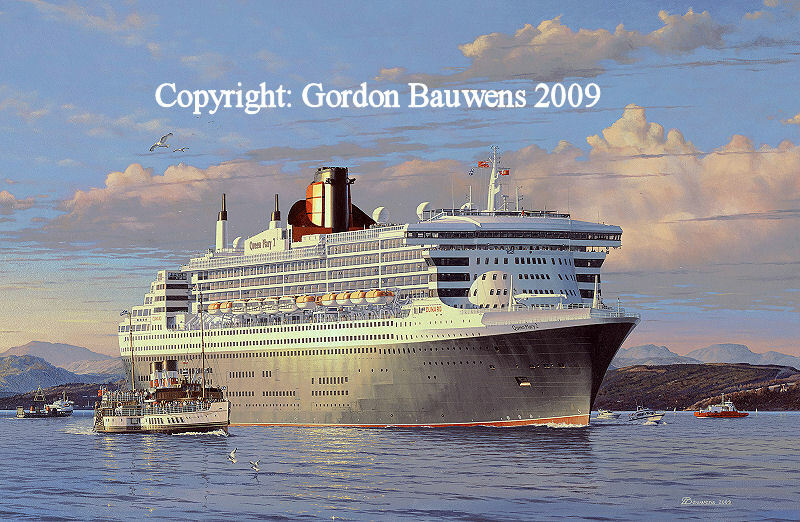 This highly detailed painting by Gordon Bauwens portrays QM2 as originally scheduled around sunset and escorted by PS Waverley. The mighty flagship is seen bidding farewell to the Clyde, bound for Liverpool. In this, QM2 followed exactly in the wakes of the very first Clydebuilt Cunarder, Britannia, and the last, QE2, during her emotional farewell round-Britain cruise in October 2008. These historic, highly-collectable Limited Edition prints are faithfully reproduced on heavy weight art paper using fade-resistant inks and are available in two different sizes. All are individually artist-signed and numbered, and come with matching Certificates of Authenticity. From an original oil painting showing QM2 on her first Clyde visit, with PS Waverley, 19 Oct 2009. Double Limited edition of 300 and 500 artist-signed prints at two sizes.